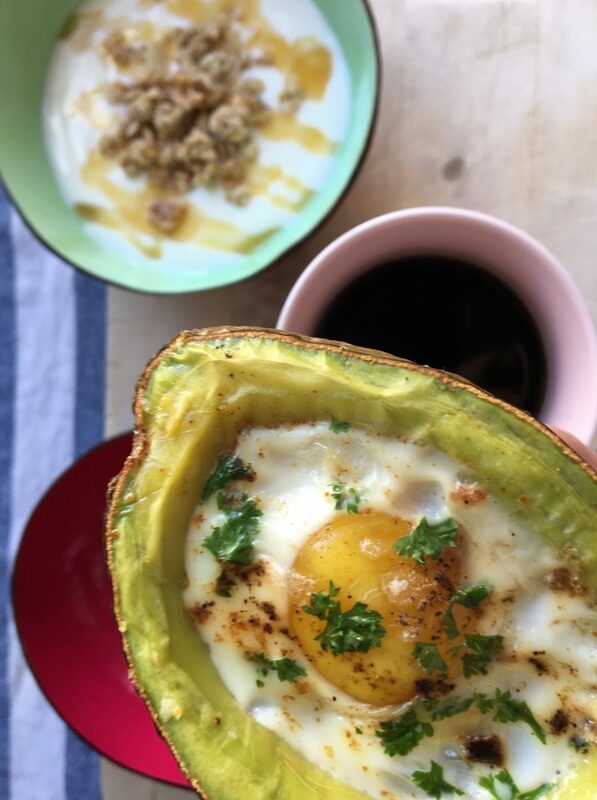 Avocado eggs are the new thing and such a great way to enhance your breakfast. You don’t need much time or many ingredients. And it’s a healthy recipe that will look nice on each breakfast or brunch table. So you can easily surprise your friends or family. So crack these eggs and enjoy! I posted more ideas for alternatives below. 1. Preheat the oven to 200° Celsius (400°F). 2. Slice the avocado in halves and remove the pits. Scoop out about 2 tablespoons of flesh to make room for the egg. 3. 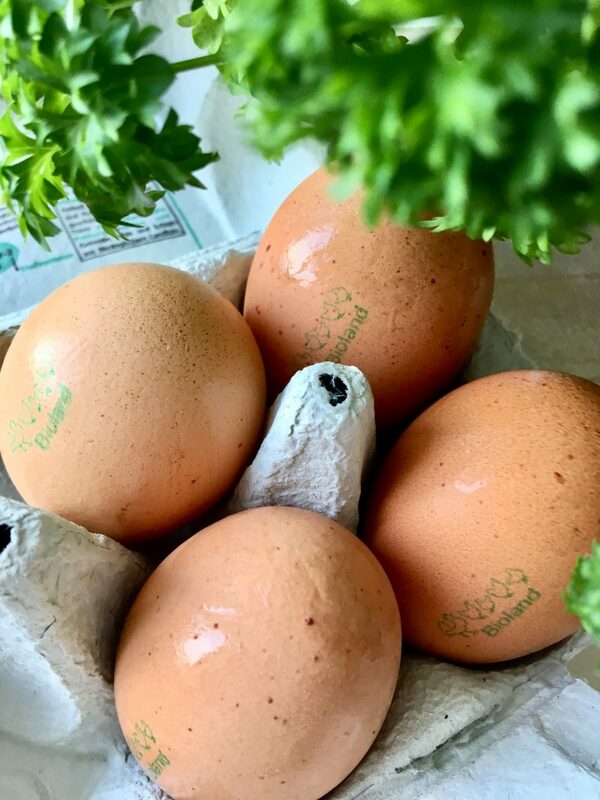 Now crack one egg into the half by starting with the egg yolk. Fill it all up with the egg white. 4. Repeat this with the other 3 halves and place them on a baking tray covered with baking paper. Make sure they don’t tip over. 5. Season each of them with salt, pepper, sweet pepper seasoning and some fresh parsley. 6. Bake them for 15 minutes. If I make a bigger portion I usually use the scooped out avocado to make a guacamole. If you are interested in the recipe please let me know. 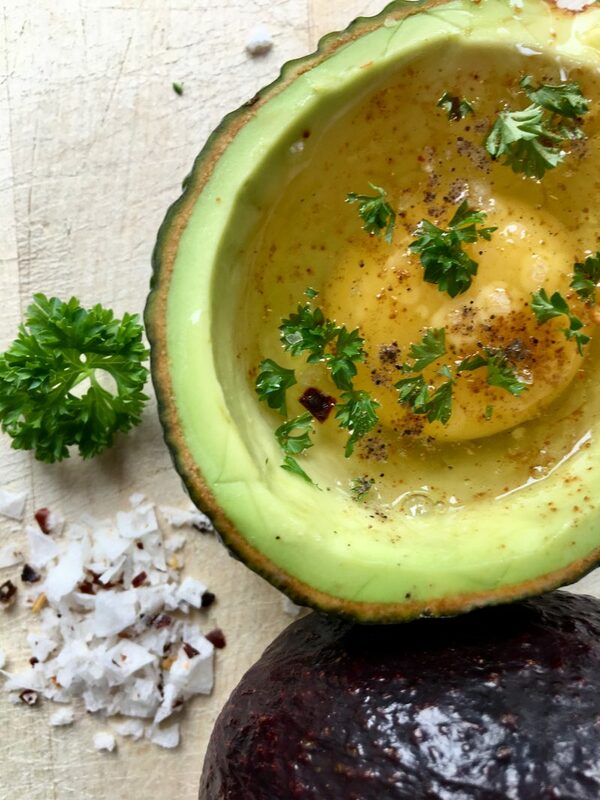 Save the pit and put it in the bowl with the avocado if you are gonna save it for later. This way it will stay green longer. I personally use a Chipotle salt with dried jalapenos for a spicy flavour. You can use chives instead of the parsley. Another idea is to add diced tomato or bacon. And if you want a fancier version, add salmon and dill. Whatever you end up doing, please leave a comment below and let me know how it worked out. Have a lovely weekend and always make time for breakfast. 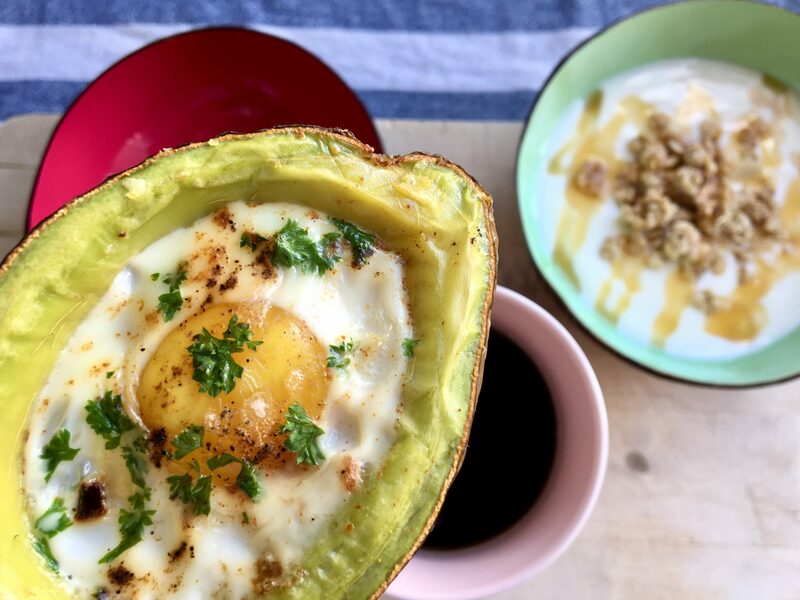 I loved how you fixed your avocado eggs. I have been on healthy cooking as well and I have become a huge fan of avocados. I eat one avocado a day with boiled eggs, cilantro, green chili, lemon, and salt. Loved your recipe. I love cilantro, so I actually might try it next time. Oja! Das Rezept muss ich unbedingt nachkochen, lieb ich doch Avocados wie wild! Genau das Richtige für heiße Sommertage! freut mich sehr, dass du auf meinem Blog vorbei schaust und ich dich inspirieren konnte. Viel Spaß beim Nachkochen und weiterhin schöne Sommertage.